Reacting to new report, area legislators say Milwaukee needs sales or income tax. 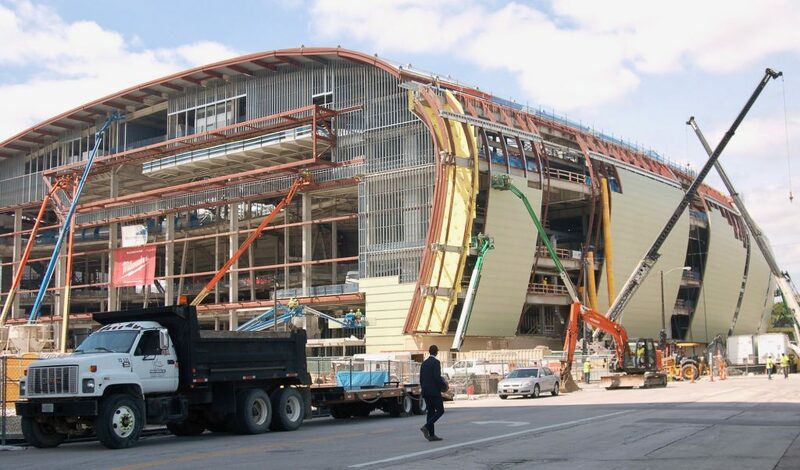 The new Milwaukee Bucks arena being constructed downtown is part of the city’s building boom. Photo by Edgar Mendez. Milwaukee is in a position to create a “world-class downtown,” which could generate much-needed income to support public works, safety and health, and additional quality-of-life benefits to surrounding neighborhoods. However, for that to happen, city, state and county officials must work together to make long-needed improvements to their antiquated revenue-generating system, according to a new Public Policy Forum report. “A key question is whether a structure that was imposed on Milwaukee by state government more than a century ago — and that makes no distinction for the city’s unique economic attributes — is adequately meeting the city’s financial needs and the expectations of its residents, businesses and visitors,” said Forum President Rob Henken. The report, “On The Money?,” is a follow-up to an earlier PPF report that identified problems with the current revenue system. 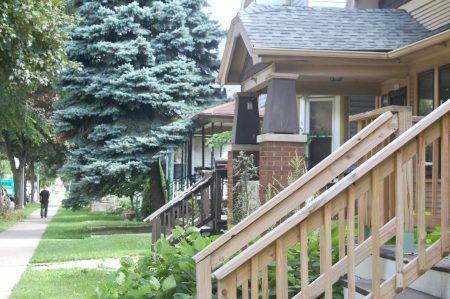 The new report, as Urban Milwaukee reported on Tuesday, looked at 38 peer cities and found Milwaukee is the only city that relies almost entirely on two revenue streams — state funding and property taxes. Other cities all levy other taxes and on average get 29 percent of their revenue from a local sales tax, which the City of Milwaukee lacks. The problem for Milwaukee has gotten worse, the study found, because state aid has plummeted since the mid-1990s, with annual aid dropping by $151 million in real dollars since then. Yet Wisconsin tax laws prohibit municipalities from diversifying their revenue streams through the use of local taxes like a sales or income tax, which might help Milwaukee weather the drop in state aid. Unless additional revenue sources are found, local homeowners will likely see an increase in property taxes in the future, according to a recent Public Policy Forum report. Photo by Edgar Mendez. With a substantial need for more police and other local services, as well as an increased number of retirees with city pensions, said Henken, Milwaukee residents are likely to see increases in property taxes unless other funding sources are found. The city’s hands are tied on the issue of its revenue structure and will likely remain so, according to Alderman Bob Bauman, who represents Downtown on the Common Council. Among the possibilities for revenue growth identified in the report is the creation of a mechanism for nonresidents who are “engaged in business, employment, tourism, or entertainment,” in the city to pay taxes on the services they use while in the city. State Rep. David Crowley supports the idea. “We need to figure out a way to tax people who come into the city and utilize the services but go home to spend their money and pay taxes there,” Crowley said. Julia Taylor, president of the Greater Milwaukee Committee (GMC), said there needs to be a way for commuters to share the costs the city is bearing by providing services to them, so that local taxpayers aren’t overburdened. “It’s worthwhile to look at usage fees to recapture the costs for other people that visit or work in Milwaukee,” Taylor said. The GMC commissioned the report as part of its MKE United effort. The city’s revenue framework has limited its progress, said Taylor, especially for low-income communities that don’t draw enough investment to grow their property tax base. “Areas that don’t have a lot of private sector investment can’t use tax incremental financing or other developmental landscape tools that help neighborhoods be successful,” Taylor said. The state’s restrictions on municipal taxes have severely hindered Milwaukee’s ability to take advantage of its many assets, Crowley said. “There are legislators around the state who feel the need to try and stop dollars from going to the city of Milwaukee, even though it’s the economic engine for the state,” he added. The city of Milwaukee contributed more than $1.37 billion in state taxes with a return of only $227 million in shared revenue payments in 2015, said Mayor Tom Barrett during his “state of the city” address in March. Crowley cautioned that any new taxes in Milwaukee should not be directed at nor disproportionately impact low-income residents. Still, if nothing is done, he said, property taxes will end up being raised, which means rent will go up and Milwaukee residents will suffer because of it. The report outlined several scenarios in which the city could provide property tax relief as well as raise income for services. It could create new local taxes such as income taxes or specialized taxes on hotels, entertainment, downtown restaurants and alcohol. Though the report did not recommend which options would best suit Milwaukee, discussion between state and local leaders needs to occur now, warned Henken. “We have had this very nonproductive argument for decades between city and state leaders about state aid. Therein lies the attractiveness of having some type of sales tax in the revenue mix of a major city like Milwaukee. Every other city of its size or larger makes use of some type of sales tax,” Henken said. State Rep. Evan Goyke said the biggest challenge is convincing state legislators outside of the city that they too will benefit from taxes created in Milwaukee. “It’s a local solution that solves a statewide problem. The more empowered Milwaukee is to generate and spend revenue and solve local issues, the less the state has to pay in a number of local areas,” Goyke said. The downtown building boom provides an ideal moment in time to capture and take advantage of the city’s growth, he added. The problem with coming to a consensus, he acknowledged, is the city’s image problem across the state, and the fact that many smaller cities are struggling as well. Goyke said the solution is to build a coalition of rural and urban communities to change Milwaukee’s economic structure. “We need to free up Milwaukee so that Eau Claire, La Crosse and Green Bay could see a benefit as well,” Goyke said. Not one comment in the article about reducing expenditures (past or present). No comments in the article about where/how the money is currently allocated. We moved from the country to the city; bought a fixer upper on the East Side. Our new house value is 60% of what we sold and our new property taxes are 50% greater. We love being close to everything, but the roads are worse and crime is higher. We patronize local businesses. If the city population is growing, shouldn’t that mean more property tax revenue? If the city population is not growing, what is being done to reduce expenditures? Milwaukee is a great town. Please don’t make it more expensive to live here. Jim…. I think the point is to take some pressure off the property taxes by diversifying the tax base. I think the city does a pretty good job of managing city services and operations under the circumstances. This is backed up by a report a few years ago that indicated Milwaukee spends less per capita than peer cities within the Great Lakes and Ohio Valley. Tom… No mention in the article that this new plan will reduce property taxes (assuming that is what you mean by taking pressure off). I actually think the various fee/tax ideas are quite regressive. @Jim – Milwaukee ranks so high on that list because it is forced by the state to rely overwhelmingly on property taxes, unlike most other large and mid-size cities in the country. If the city was permitted to levy gas, income, sales, or other taxes, it is almost certain that the property tax rate would be lower, particularly given that many other taxes would be paid, in part, by nonresidents (visitors, commuters, etc). I do share your concern about the regressive nature of some taxes (sales in particular, less so income and gas, for instance). @Eric S, is Madison allowed to levy those other taxes? Similarly priced homes in similar areas have lower taxes… Even with large numbers of buildings being exempt from paying property taxes..
By using things such as a sales tax, the city could collect taxes from non-residents and non-property owners that come in to the city and use it’s services. This could be anyone from suburban commuters to out of state business travelers and tourists. This would obviously take some of the burden off property owners. More tourism dollars are spent in MKE County than anywhere else in the state, this would allow the city to keep more of it in the city, instead of being shipped out-state. Increasing tax revenue by rising taxes in the city is a stupid and short sighted idea. Think of ways to better use the money you have. Increasing development will increase tax revenue. Going to see Bucks games increases parking revenue, dining and restaurant revenue etc, which in turn increases tax revenue. Kicking up taxes on hotels etc only means you are making it more expensive for hotels and other businesses to locate to Milwaukee which hurts EVERYBODY!!! You want more businesses not fewer. Haven’t you politicians named in the article learned anything from our neighbors to the South? We are already a high tax area and bringing in more businesses should help to lower that if politicians do a better job using the current revenue as well as future revenues. @Adam. Thanks. I missed that. The sceptic in me would does not believe property taxes will go down, but I would sure love it if they did. I wish there was some way to get the revenue that did not make it more expensive for the residents, so let’s pick hotel taxes. This site says 4500 hotel rooms and 66% occupancy. Let’s put the average per night rate at $200. Now add a 10% tax. That’s $60k in new taxes. Since I am missing “non-downtown” hotels, 4x the number to $240k. Hardly seems like a drop in the bucket. What else would we tax? BG…. per capita spending in Milwaukee is already relatively low. That’s a pretty good measure of efficient spending. A sales tax captures revenues from people using the city and takes some of the pressure off residents. We have to pay for infrastructure, police, garbage… etc. of those coming here to work or visit. Balancing the tax code encourages development and might keep people from moving to other cities and counties. Jim, I believe that, on a per capita basis, Madison collects more than twice as much property tax as Milwaukee, both in city tax and school tax. In 2013, Milwaukee city property tax levy was $245 million ($411/resident), while Madison (with less than half as many people) levied $198 million ($834/resident). Milwaukee’s school levy was $308 million ($516/resident), while Madison collected $254 million ($1,066/resident). The problem is that Milwaukee’s full assessed value is $26 billion (or about $44k/resident) while Madison’s numbers are $22 billion (or about $92k/resident). This assessed value difference means that Milwaukee has much higher property tax rates. This document also shows that the City of Milwaukee collects less (per person) in property tax than virtually any Milwaukee suburb. Seems simple to me. People that want to live east of the Milwaukee RiversShould pay more for that experience. Every one that does not live on the east side or downtown complains they have to much economic activity. You want to live near a trolley pay up. I think I follow…. Are you basically saying the aggregate property value in Madison is higher, therefore the assessment is lower? Doing a simple spot check on SF houses in the $200-400k range (in the urban areas of both cities) certainly indicates they are paying lower property taxes. If I am following, the answer is for Milwaukee to increase home values. How would new revenue streams do that? Tom T. – it would be interesting to see what percentage of revenue generated by a sales tax would come from city residents vs other. It certainly feels like city residents would contribute the largest share. Jim. Sure… but some studies show that up to 35% of sales taxes are paid by residents from outside the taxed area vs. O% for property taxes. Jim – in your example of 4500 rooms at 66% occupancy = 2970 rooms/night. At an average nightly rate of $200/day, that works out to $594k/day. With a 10% hotel room tax, it would generate $59.4k/day. You would need to x365 days to get an annual revenue #. That would come to 365 days x $59.4k/day = $21.7 million. Not as much of a drop in the bucket if our property tax levy $245 million. Granted a 10% increase in hotel rates would decrease demand, but a more palatable % could provide a way to help at least hold down property tax increases. How about a local tax on alcohol/bars? People already drink too much in Milwaukee and Wisconsin in general – the city might as well make a profit off of it. Maybe taxing it would encourage people to not drink AS MUCH and reduce drunk driving, which would reduce fatal accidents associated with it. Sounds like a win-win to me. Jeff – DOH! Stupid math mistake on my part. Thank you. I had typed up my reply to point out the fact that a hotel tax might sound good, but would likely not be effective. You have proven me wrong. Yes, higher room costs will affect demand, but I would be interested in looking at data to try and find that tax amount “sweet spot”. I think it is very hard to tax “only those not paying in now”. Hotel taxes are about the only way to do it that I can think of. I think the majority case of a “resident” paying those taxes would be when a local company is paying for the hotel room of a business visitor. Rental car taxes could work, but MKE is a county endeavor. Even the sales tax example offered by Tom T struck me like this: I, as a local, agree to spend an additional 65 cents for every 35 cents you give me. Not a good enough ROI IMO. I still believe we have more of a spending problem than a revenue problem. I also think it can’t be fixed overnight because many promises (pensions, healthcare, bonds) have been made that should not be reneged upon. The best I think one could hope for is to slowly wind down those costs thru attrition and efficiency. Again – thanks for catching my stupid mistake.